Stiff, heavy muscles are nothing new for any runner, but I'm now starting to be increasingly bothered by spasms and spasticity in my legs. Most mornings I stagger around on stiff legs until the muscles seem to wake up properly and let me move more freely. As you can imagine, this is somewhat tiresome. After a relatively good run over the last few years that saw me complete two full marathons with barely an issues at all, I've had a few niggly little problems recently that have affected my running: muscle problems in my leg on the weaker left side of my body held me back a little over the second half of last year; there was the never-ending chest infection that lasted six weeks around Christmas; and now there's a cracked rib and a broken toe... My wife sometimes remarks that I've had a good innings and it might be time to put me out of my misery by taking me on one final journey to the vet. I won't lie to you: it's annoying. Lots of my friends have been getting fitter and fitter and are really pushing their limits and seem to be lowering their PBs every week. I've never really been all that interested in PBs (or in competitive running), but I'm very happy for them and have been inspired by their progress. What I find frustrating isn't that I'm not running super-fast and smashing all my PBs, but rather that I'm not running as fast as I would like. 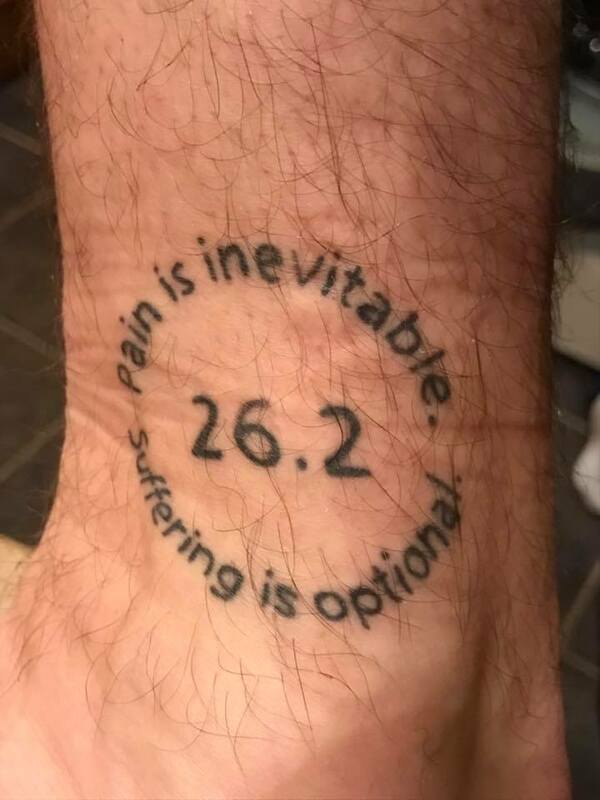 To some extent, that's true of every runner who ever laced up their trainers... but equally, I'm keeping a weather eye out for any sign of permanent physical deterioration, and I don't like what I'm seeing. Yes... it's true that by almost any benchmark, I'm doing pretty well. I'm 42 years old and I suffer from multiple sclerosis.... and yet I ran the London marathon in 2015 and 2016; I ran 45km in 24 hours at Thunder Run in July last year and will do at least the same again this year; I covered well over 1000 miles last year and I would expect to do something not too far off that again this year. Whilst I might not be running as quickly as I would like, I'm not actually running too slowly at all. Marathon training seemed to take some of the speed out of my legs over the last couple of years, so now that I'm not doing the really big training runs, I'm probably trending faster year-on-year. But I want to do better. My body might be starting to give me some warning signs, but this is making me more determined than ever to flog as much out of my body as I can while I still can. That's why I'm going to join a running club and why I'm going to continue to drive myself as best I can at their track sessions on a Thursday night. I don't want to slip gracefully into a gradual decline... I want to fight it all the way, kicking and screaming. Another friend asked me today how I could even think about running with a cracked rib and a broken toe (never mind the rest of it). I told her that it doesn't seem to make them any worse, and it's only pain*. Her: "I think I need you in my antenatal class tonight [she's a doula] when we talk about labour." Me: "Well, I wouldn't have the brass neck or stupidity to lecture those ladies on pain management!" Her: "No but you can tell a good story about the difference between pain and suffering." Funnily enough, I have a tattoo about that. * I also take painkillers. I'm not an idiot and will-power can only get you so far. Hi. Just started running again after a few years and I've noticed that I can't do the distance I used to be able to do. I think three miles is my maximum at the moment. When I come to the end of the run my feet are dead weights. Maybe I shouldn't be out running at 6am. Perhaps aim for something else rather than running PBs (not that you are)...? One reason I want to get fit is that I'm thinking of climbing Kilimanjaro for either the MS Trust or the MS Society in 2018 (10 years since diagnosis). I'll probably chicken out of it, though, it's a lot of sponsorship. But yeah. Have you seen that film of the high school girl (USA) with MS who runs without the ability to feel her legs? Her coach catches her at the finish line. Thanks Dave and great to hear from you. Hope you're doing okay. It's a funny thing, running. I doubt any runner is ever really satisfied with the speed they're running at. I'm miles off my PB for 5km and have been for some time as I've focused on distance, what's changing is the way my legs are feeling... but I've had two heavy colds in the last 3 months, which will hardly be helping. The point of the running club for me is to shake myself out of my comfort zone and to not just lie down and die. I may always be at the back in their sessions, but as long as I'm doing what I'm can! Kili sounds good - you can definitely tap me up for a donation. And yes. Kayla is amazing, isn't she?